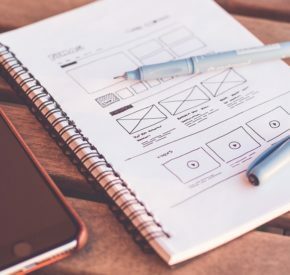 According to an industry report from Social Media Examiner in 2018, marketers cited visual images as the most important type of marketing content they create. (PDF) And that’s not terribly surprising given that evidence shows that visuals help us retain information. According to a meta analysis of 55 studies on the use of illustrations in education, visuals improved comprehension in 98 percent of those studies. Since the earliest cave paintings over 35,000 years ago, humans have been using images to impart information. We’re literally neurologically wired to learn information visually. For you, as an eCommerce store owner and email marketer, this means the design of emails impacts how likely your subscribers are to consume information, remember it, and take some kind of action. Designing great emails isn’t as simple as throwing some images and text into a template and calling it a day. If you want to truly stand out, you should use every tool available to create great content. One of the most effective tools for organizing information is the theory of visual hierarchy. Visual hierarchy essentially refers to the way design influences our perception of importance. You can encourage your subscribers and customers to engage with your content by leveraging the way they naturally process information. Readers explore content based on natural tendencies—specific patterns and preferences most people exhibit when viewing content. You can create strong visual hierarchy to reinforce those tendencies or break visual hierarchy to disrupt them. Conversion expert Peep Laja believes visual hierarchy is an important tool that marketers can deploy to exploit those tendencies. “We can say with a fair amount of certainty that visuals influence the split-second purchase decisions that consumers make without even realizing it,” he says. Simply put, your goal as an email marketer is to arrange your email content in a way that tells a story. It should walk your reader down a path so they consume the most important piece of information first. This increases the odds that they’ll keep reading, and ultimately make a purchase (or complete some other goal). For example, since we tend to place a higher value on objects that are larger, it makes sense to display the most important element in your email as the largest. This aligns your email content with the reader’s natural preference and nudges them toward reading more and/or making a buying decision. There are many characteristics of visual hierarchy, but below are some of the most common pieces that you can use to design more effective emails. We tend to follow predictable paths when we explore content. Eye tracking studies by the Nielsen Norman Group show that readers tend to scan text-heavy content in an F-pattern. The reader scans across the top line, then across the second line, then down the left column. The Z-pattern is a path that readers tend to follow when they explore web content that isn’t displayed in paragraph blocks. The reader scans across the top, then down and back to the left, then across the lower portion. They repeat the Z-pattern as they progress through the content. 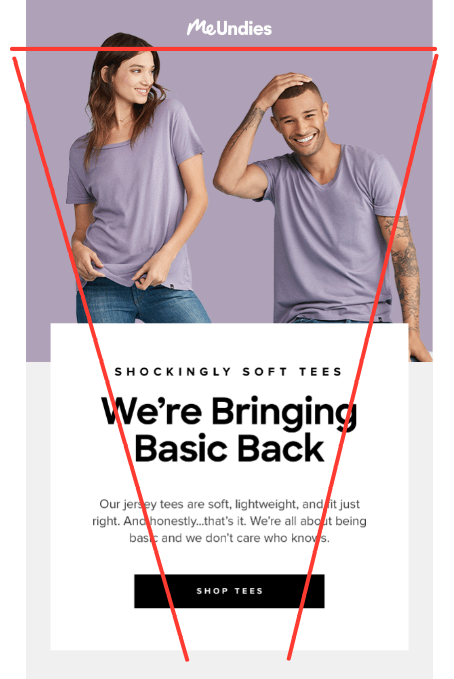 The inverted pyramid is a design pattern that puts the most important information on top and guide the reader toward a conclusion (or, in the case of most emails, an action). It’s useful for simple content with a single focus. It’s good for emphasizing a small group of elements that end with the reader taking an action. Finally, the Gutenberg diagram is useful for web pages and emails with dense content. It involves breaking content into four quadrants: The primary optical area (top left), the strong follow area (top right), the weak follow area (lower left), and the terminal area (bottom right). In this model, the eye skims the content starting in the primary optical area and falls diagonally to end in the terminal area. Important elements should be placed in the reader’s path—the primary and terminal spots. Unsurprisingly, larger objects signify more importance and get noticed first. Keep in mind that we’re not talking about actual size, but the relationship of sizes across elements. That is to say, there’s not magic font size or pixel height that will always get your message noticed. What matters is that you make more important items larger than less important ones. Since all cultures read from the top to the bottom, objects higher on the page are perceived as more important. The highest element is usually your logo so your subscribers know who sent the email. The second element is your hero content, with imagery and copy that relates to the purpose of the email. Naturally, bright colors tend to catch the eye. Your readers will assume you want them to look at something that pops off their screen. Bright reds, yellows, oranges, and pinks are hard to miss. The variation between colors is also important. Important elements should contrast with the rest of the email. For instance, you might use a black hero image on a white background, with a yellow call-to-action button. Denser elements indicate weight and importance. For instance, a photo of a crowd of people would be viewed as more important than an image of your product on a white background because there’s more going on. One way to add density is to overlay text on an image. This draws the reader’s attention and helps relate the copy to the image. Separating elements with white space helps the reader understand where one element ends and the next begins. This is called chunking. If the reader can identify, for example, what’s part of your hero section and what isn’t, they’ll know how to evaluate its importance. Elements that deviate from the alignment of other elements will attract your subscribers’ attention. For instance, a center-aligned heading would be perceived as more important than a left-align body copy, even if the type size and weight were the same. Elements that repeat create the impression of a relationship. For example, two buttons with the same color and text indicate that they take the reader to the same place. Elements placed close together are perceived as related. A bank of product photos, for instance (see the HermanMiller Store email below), indicates that they’re all part of a group. You’ve probably seen hero sections countless times. 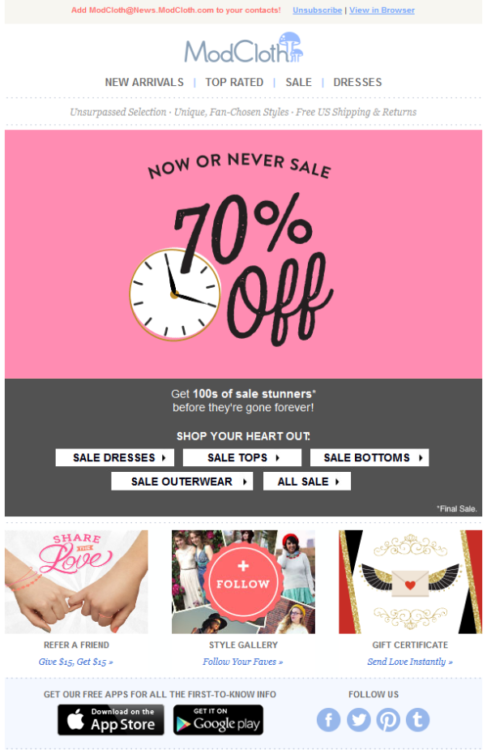 In the ModCloth email below, the hero section is the big “70% Off” block below their logo and navigation elements. This email uses the inverted pyramid pattern we mentioned earlier. The most important piece of information is also the most prominent: A big sale. The details of the sale don’t matter right away. The first thing the customer needs know is that ModCloth is offering a big discount. Your hero image can be as simple or complex as you like. It could include text, or not. It could be static or an animated GIF. You have a lot of freedom to play around, just keep in mind that it should be attention grabbing. As we fall deeper into the pyramid, we get the less important information. It lets you know that there’s a big selection (“100s of sale stunners”) and adds in some scarcity (“before they’re gone forever”). Now that the reader understands the message, they can follow one of the five links to sale pages. The call-to-action buttons are the bottom tip of the inverted pyramid. You can tell right away that they’re the “end” of the message, even though ModCloth has placed additional elements below. Use high-quality images. This section represents your entire email, so make a good impression. Research from the Nielsen Norman Group finds that users pay extra attention to images as long as they carry relevant information, so make sure your hero image relates to your overall message. Keep your messaging short, simple, and clear. Don’t write paragraphs, speak in metaphor, or try to pack in too much information. Boil your message down to its simplest, most essential component. Stand out from the rest of the email with eye-catching colors and typography. Segment this section based on your recipients. For instance, you might show different hero images for men and women or different content based on your subscribers’ purchase history. This HermanMiller Store email is an excellent example of visual hierarchy. This email uses the F-pattern. Your eye is drawn across the top row (main image of a chair), then the second row (headline, subheading, and call to action). We know the creators want us to focus on the top two rows because those elements are substantially larger and bolder than the rest of the email. The bank of product photos makes up the third element on the page. Since they use similar placements, weights, alignment, and density, we know they’re related, however different colors are used to create visual separation between each chair. It’s easy to scan over them without looking at them individually. This Withings email is another fantastic example of visual hierarchy. This email’s structure is simple but powerful. It takes advantage of the Z-pattern. Your eye is drawn across the top row, then you can’t help but zig-zag through the content. The back-and-forth format of the product’s features is repetitive, which indicates they’re related and should be consumed as such. By alternating text and images, left to right, right to left, the email’s design naturally guides readers in a familiar Z-pattern. It’s like walking down a path the brand has laid out for you. Interestingly, notice how the price of the product is small and placed at the very end. Why? Probably bcause price isn’t a big factor for their target consumer. 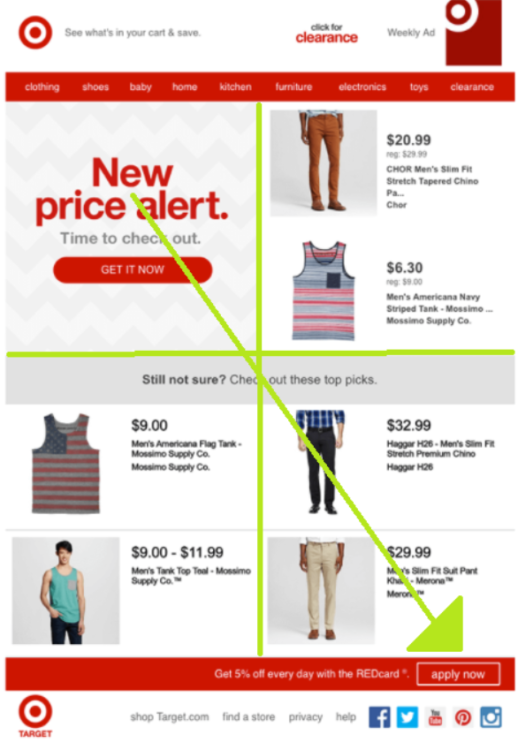 Ready to put visual hierarchy to work in the design of your marketing emails? Answer the following questions to make sure you’re using it effectively. Lean back from your monitor and squint your eyes. Can you still understand the content of your hero section? If you can’t see it well, make it larger and bolder. This section needs to be immediately recognizable to your subscribers as they flip through their email. 2. Are your email is easily scannable? Email readers often scan an email to decide if they’re interested in giving it more attention, so it’s important to exploit their scanning pattern. We generally scan emails in a Z pattern. Place important elements at the points of a Z (top left, top right, middle left, middle, right, etc.) in order from most to least important. 3. Are you using white space around your elements? Each distinct element in an email should be surrounded by enough white space for the reader to tell that it’s a different element. For instance, don’t cram three or four product photos on the same row without any separation or the reader may not know where one ends and the next begins. Overlays are the exception here. You can overlay a button or text on an image. 4. Do important elements use bigger fonts and heavier weights? Typefaces at the top of your email (which is where your most important content will be) should be the biggest on the page and use the heaviest weights. Use similar fonts for everything below, but smaller type and lighter weights. 5. Are you using a limited color palette? Limiting yourself to a few colors makes it easier to use them strategically. An email with 10 colors can’t easily use one to highlight an important element—there are so many colors, it will be hard for readers to distinguish one from the others. But an email that sticks to just a couple colors can use a third to signify importance. You can play around with opacity as well. Tinted objects are considered less important than full color objects. 6. Did you limit your use of direction? Emails are generally designed on a grid that’s pleasing to the eye and helps your readers follow the content downward. Slants and angles stand out right away, so reserve them for only the most important content you want to highlight. This is a way of cleverly breaking a rule to create emphasis around an element. Visuals are critical parts of email marketing. Without them, your emails will appear drab and unexciting. Even worse, they’ll look poor in comparison to all the other emails your subscribers undoubtedly receive every day. Make sure you deploy visuals in a smart way and make sure your emails follow the principles of visual hierarchy, so that the more important information is being highlighted for readers.